Voice of Specially Abled People’s Gujarat team took initiative to organize an event to discuss with Civil Engineers and Architects of Gujarat (GICEA) to promote awareness for designing and building Accessible infrastructure in smart cities. Ahmedabad is being developed as a SMART CITY with huge investments on building infrastructure so timing is just right to ensure we follow Accessibility standards. GICEA and VoSAP will work together, forming task force teams to continue promoting accessibility with builders, AUDA, AMC, Govt. of Gujarat and Gujarat Technology University to include in syllabus so future generation engineers and planners are knowledgeable with the Universal Accessibility Standards etc. During the event, Keynote speaker, Shri Dr Kamlesh Kumar Pandey, Chief Commissioner of Persons with Disabilities, Govt. 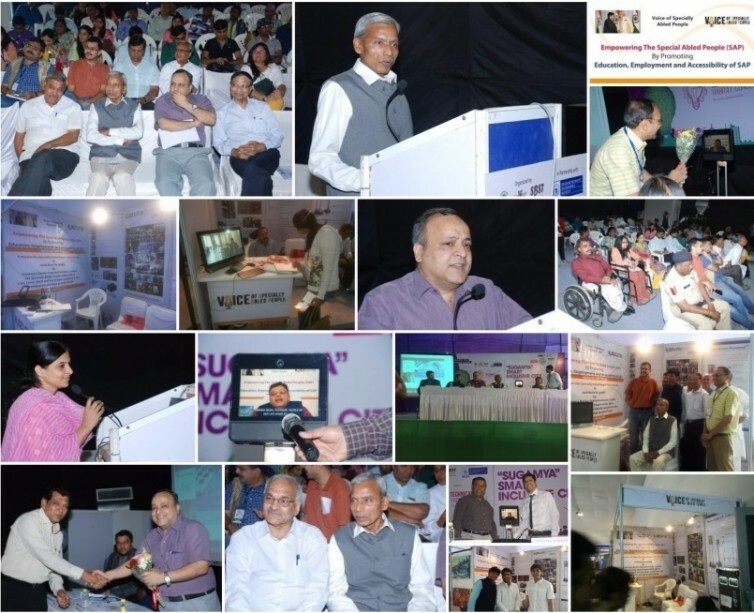 of India addressed the audience and emphasized on Empowerment related initiatives, contribution of Voice of SAP for providing thought leadership of “Accessible India Campaign” and assurance that he and his team in Gujarat, Commissioner of Disability (Shri Sanjay Nandan) will do their best in addressing grievances of disability community. Shri Pranav Desai, founder of VoSAP suggested civil engineers and architects of Ahmedabad to put all efforts and be # 1 in the country on Accessibility Index as Gujaratis have global experience, exposure of accessibility solutions that can help and inspire them to be the leaders in India. Ahmedabad: Two top government initiatives Smart Cities and Accessible India converged at Habitat Conclave, as experts discussed `Sugamya’ smart cities as part of the technical sessions on Sunday . Kamlesh Pandey , chief commissioner for persons with disabilities (CCPD) of government of India’s ministry of social justice & empowerment (MSJE), and Sanjay Nandan, commissioner (disabilities) of government of Gujarat also participated in the discussion along with activists and NGO representatives. Pranav Desai, an NRI and advisor to MSJE, addressed the gathering from the US. He elaborated on the idea of disability and drew parallels between infrastructure of developed and developing nations. ” As per estimates, India has around seven crore differently-abled persons. If we assume an average family size at five members, the issue is affecting 35 crore Indians. Technology and government policy is the only answer to amalgamate the disabled in mainstream,” he said. Joy Doctor, a volunteer with Voice of Specially-abled People (SAP), a national NGO, said that the discussion is timely , as a lot of infrastructure is still in the making.